Heat stroke is a deadly condition which occurs when high external temperatures cause your dog’s body temperature to rise dangerously high. If untreated heat stroke can lead to multiple organ failure, seizures, and death. Dogs suffer more in hot weather than people do. Unlike us, dogs only have sweat glands between their paws and are covered in a thick fur coat. Dogs keep themselves cool on hot days by panting, seeking water and lying in the shade. All dogs may be at risk of heat stroke, but some more so than others. There are two kinds of heat stroke, exertional and non-extertional heat stroke. Exertional heat stroke occurs in active dogs who overheat while racing around on a hot day. Non-exertional heat stroke is seen in non-active dogs on hot days, whose normal cooling mechanisms are somehow compromised. All brachycephalic breeds are at risk of heat stroke. Brachycephalic breeds include English bulldogs, French bulldogs, Pugs, Boston Terriers and Brussels Griffons. When a normal dog pants air passes through a web of moist bony spirals in the nasal cavity. This helps the dog cool down. In squishy faced dogs the nasal cavity is compressed and deformed. Panting does little to help these dogs cool down. Brachycephalic dogs also suffer from an excess of soft tissue at the back of the throat. This tissue swells in hot weather and can lead to life threatening obstruction of the airways. Brachycephalic dogs have been known to develop heat stroke on hot days even if they are in the shade, not moving. What happens when a dog gets heat stroke? If body temperature remains high for too long, cells within the body start to die. Blood pressure drops, sending the dog into shock. Cells of the heart, liver and kidneys begin to die as a result of heat and poor blood flow. Fluid builds up in the lungs, making breathing difficult. The brain overheats and seizures occur as it starts to shut down. Dehydration and causes excessive blood clots to form in the vessels, rapidly using up all of the dog’s clotting ability. Once a dog is unable to clot its blood it can bleed excessively. Bloody vomit and diarrhoea is common in heart stroke cases. 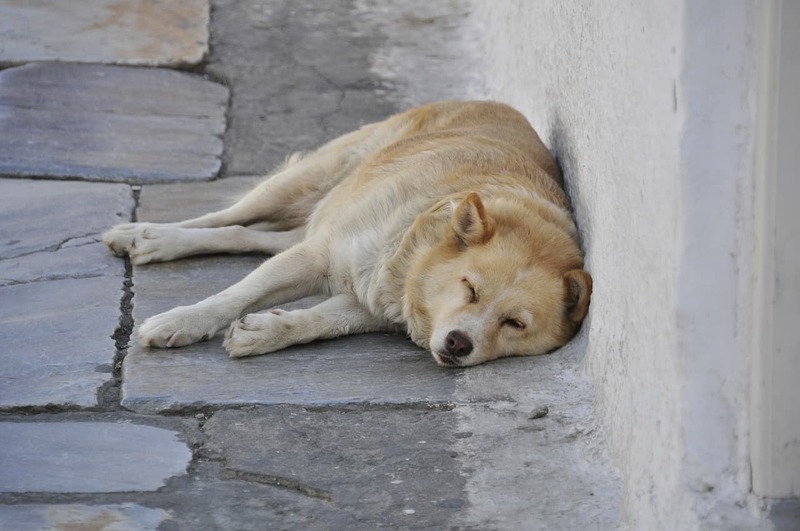 Everything described above occurs VERY quickly in heat stroke dogs- within minutes to hours. Multiple organ failure can even occur several days after a dog has seemingly recovered from heat stroke. If your dog shows any signs of heat stroke head immediately to your vet. Heat stroke requires aggressive, intensive emergency treatment. Most dogs require fluid support and medical therapy to help prevent multi organ failure. Delaying treatment dramatically increases the risk of mortality in heat stroke dogs. Start cooling your dog on the way to the vet- Spray your dog with cool water, put aircon on full blast or bring car windows down. Do not use ice water or ice packs to cool a dog in heat stroke. What happens at the clinic- We commence emergency treatment as soon as your dog arrives. This involves providing oxygen support, placing your dog on IV fluids and continuing cooling. Most dogs will require close monitoring and continued hospitalisation for at least 24 hours. During this time we will also perform blood testing to check for damage to the liver and kidneys. In the case of heat stroke, prevention is always better than a cure. If your dog is ‘squishy faced’ or brachycephalic, he/she is at high risk of heat stroke- In these dogs, surgery is often recommended to improve airways and cooling mechanisms. You should schedule a FREE breathing assessment with one of our veterinarians at Southern Cross Vets to determine if your dog requires airway surgery. On hot days walk dogs in very early mornings or late evenings only. Brachycephalic dogs should not leave a cool house at all on days over 30 degrees celcius. Provide your dog with plentiful shade and cool water. Plastic sand pits with water are also a good idea to give your dog a place to cool down when you may not be at home. If your dog is an at risk brachycephalic breed, keep your dog inside under aircon on hot days. Take water on walks or to the park. Stop and encourage your dog to drink where possible. Make your dog rest frequently on hot days. If you notice your dog tiring or panting excessively, stop and make them rest. Some dogs will continue to exercise and ignore warning signs that their own body is giving them. Owners of these dogs should enforce regular rest breaks.